The redhead lurched upright in bed, immediately scrambling to stand, unconscious of the sheets tangled around her legs. She tumbled over and rolled off the bed, landing on hands and knees, looking down as if there was a part of her surprised to feel only polished floorboards beneath her palms. "Tara?" she whispered in the darkness with a look of sorrow and loss. The young woman blinked, noticing the darkness of the early hours around her as if realizing where she was, who she was...and that the pain she thought would tear her apart was nothing but a nightmare, already fading. She leaned back and sat on the edge of her bed, straightening her nightshirt. After a brief effort at untangling her sheets, she closed her eyes and tried to catch a few more hours of fitful sleep. The laughter of two women echoed through the empty city streets. They walked slowly, with a perceptible tendency to veer from one side of the pavement to the other, each recounting slurred anecdotes from the party they had just left, giggling uncontrollably at each other's tales. A tall man, keeping to the shadows offered by the doorways of buildings, followed them at a distance. 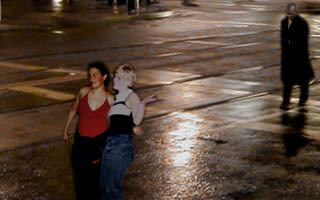 The two women reached the mouth of an alley and, seeing a short cut on their slightly intoxicated way home, turned down it. The man quickened his pace as soon as they were out of sight, seeming not to care when he passed beneath the glow of a streetlight. As he approached the alley, his features warped into the bestial visage of a vampire. Katherine Allison opened her eyes and stared out at the city for a moment, as if taking the time to focus her Slayer senses. "Corner of Granger... and Fifth," she said after a pause. Her Watcher jammed their vehicle into gear and both were pressed back in their seats as the buildings on either side of them began to flash by at high speed. "Standard vampire activity?" he asked as he steered. Katherine frowned, trying to decipher what her senses were telling her. "I'm not sure," she said hesitantly, "i-it feels like a vampire, but it's... softer, quieter... I'm not sure I can explain it." The Watcher listened but didn't comment. "Stand by," he ordered instead, "coming up on that location." The sound of the vampire's hurried footsteps seemed to finally penetrate the alcoholic haze of his victims, and they turned and screamed at the sight of their pursuer. The creature put on a burst of inhuman speed, cursing that his prey was sober enough to run. His stride lengthened as the women darted around the corner into the street at the alley's end, both pausing to take one more frightened look at him. He bared his fangs in anticipation as they disappeared, now separated from him by a handful of seconds. He drew up in shock as, with a roar of turbines, a skimmer swooped down out of the sky to fill the alley, blocking his pursuit of his next meal. One door of the vehicle was already open, and from it a young blonde woman dropped to the ground, taking the long fall with ease, boots crunching onto the pavement, her long black coat billowing behind her. She straightened up, her eyes fixed on the vampire. Slayer and vampire charged each other like the natural enemies they were. A stake appeared in Katherine's hand and she lunged beneath the demon's first punch, surprised when he twisted in mid-attack to let her strike fly harmlessly by. She seemed even more surprised when her automatic defensive roll barely kept her out of harm's way, as the vampire instantly tried to slice her back open with a blade that had slid down from his forearm. "He's very fast!" she yelled into the radio headset hooked over her left ear. The skimmer dropped down behind the combatants, headlights flaring, silhouetting the vampire, who turned towards it with a snarl. "Take it alive," ordered her Watcher calmly. Katherine let out an exclamation of disbelief even as she automatically transferred her stake to her left hand, pressing the fingers of her right into her palm, feeling the tingling sensation as the stunner covering her hand came alive. The vampire hissed into the glare of the headlights, tearing off his coat to reveal body armor beneath it. With no further warning a rocket howled out of his sleeve, barely missing the skimmer. 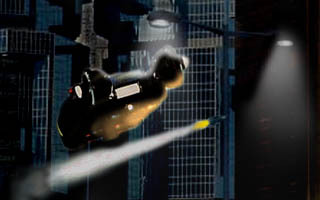 The vehicle swerved higher into the air as the rocket weaved across the street and exploded against the side of a building in a dark crimson fireball, showering debris to the ground below. "Highest priority," yelled the voice of Katherine's Watcher in her ear, "take that one alive!" "Easy for you to say," she grumbled as the skimmer veered out of sight behind the corner of the nearest building. She sprinted towards the vampire, who was already turning to meet her, arm outstretched, his hand nothing but a charred lump. For a split second she hesitated as if wondering if he had another rocket hidden away somewhere, but then a barrel appeared from his sleeve, and five shots rang out through the alley. Katherine swore under her breath as she pushed her body to dodge each bullet, one after another. That at least seemed to surprise her opponent, if the deepening of his exaggerated frown was anything to go by. In the time it took him to react and try to aim she had reached him, blocked his hurried blow, and closed her right hand around the wrist of his damaged weapon-arm. 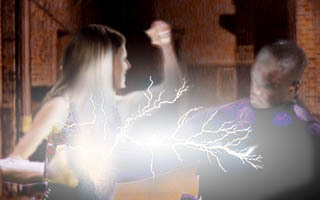 The vampire convulsed as the massive electrical charge in Katherine's stunner glove coursed through his body. The top layer of his skin flew apart in a shower of dust, but aside from that he remained solid, his limbs jerking as the incapacitating current flowed across him. After a second Katherine drew her hand back, and the vampire collapsed to the ground. "He's down," she said in a tired voice as she crouched by his side. Behind her the skimmer reappeared, settling hesitantly to the ground as its damaged engine sputtered in protest. Katherine pulled the vampire's sleeve up, gasped, and turned to see her Watcher approaching. "Sean," she said warily, "you'd better see this."